Joining 27 galleries in North America, Studio22 brings the Cape Dorset Annual Print Collection to art lovers with a special interest in graphics & contemporary art from Nunavut. 11 Inuit artists, 34 prints and a whole lot of buzz worldwide! For many people, Nunavut is an intriguing part of Canada. How do people exist in isolation and freezing temperatures? Who are the first peoples of this land? Are they witnessing climate change? Why are their artists so gifted in talent? There is a thriving studio in the tiny hamlet of Cape Dorset on Baffin Island. Many Inuit artists in this print co-operative called Kinngait (high mountain) have been celebrated in galleries around the world and travelled to receive accolades and to collaborate with other artists. They choose to return home to make their art, raise their families in a hunting culture, speak Inuktitut, and live in a place many Canadians would think of as barren. Their community is anything but barren, and the prints that southern patrons collect eagerly are proof that it is a colourful, humorous and provocative place….and its not so cold if you dress right and have a cosy studio to work with your peers in. The annual collection is in it’s 59th year and the art is wildly different from the naive traditional images that were first sent south. Come in to see contemporary work by savvy artists. Gain a little understanding at this time of reconciliation. 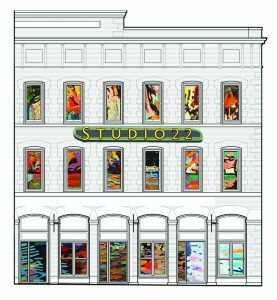 Studio22 teams up with Ellen Fraser, host of online print gallery Print Inuit, for this exhibit.